New Orleans May Still Be Vulnerable To Major Storm In the five years since Hurricane Katrina hit New Orleans, billions of dollars have been spent to protect the city. Once the upgrades to the city's flood protection system are complete next year, officials say New Orleans will be protected against a 100-year storm event. But some say it doesn't protect the city from a huge hurricane. If you talk to activists, officials and New Orleans residents, they'll tell you that one of the worst disasters in U.S. history -- the flooding of New Orleans -- wasn't caused by Hurricane Katrina but by the failure of the flood protection system. Over the course of several hours on Aug. 29, 2005, floodwalls collapsed, pumps failed and a 25-foot storm surge was funneled into city neighborhoods. It was a failure due to poor design and faulty construction. Five years later, billions of dollars have been spent to protect the city. 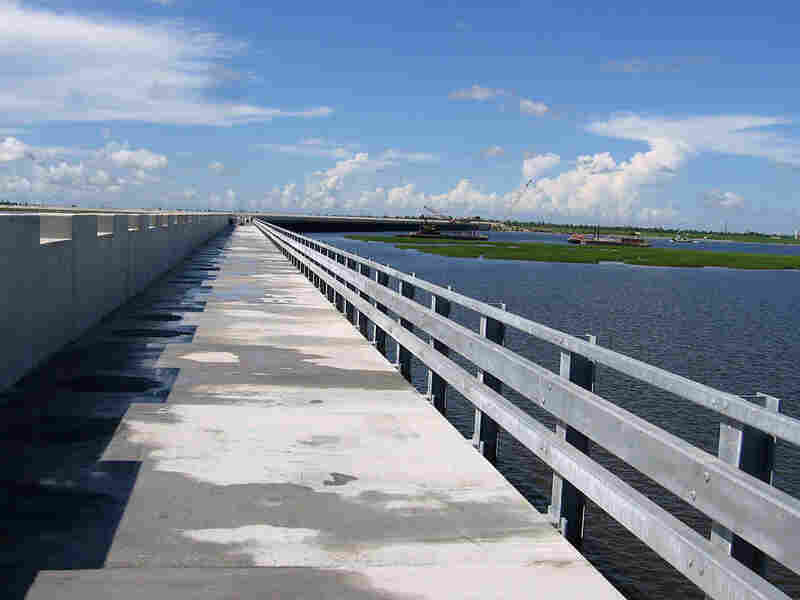 But the new flood protection system still leaves New Orleans vulnerable to a major storm. 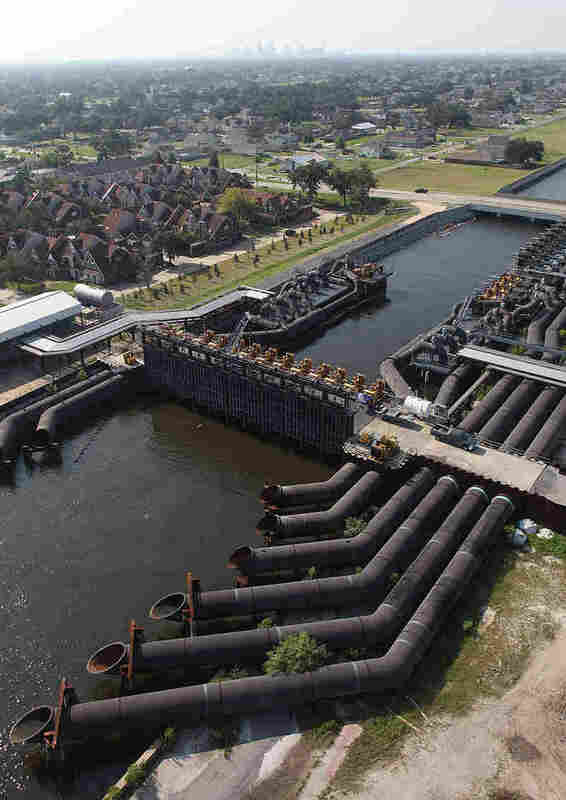 One of the places where floodwaters surged into the canal, breaking through floodwalls and pouring into nearby neighborhoods, was where the 17th Street Canal flows into Lake Pontchartrain. A historic plaque now commemorates those events and the flood that killed more than 1,400 people and displaced more than 1 million others. But the 17th Street Canal has changed. A floodgate and temporary pumps are now in place. Permanent pumps will be installed soon. Tim Doody, head of the area's flood control authority, says it offers new protection to the neighborhoods that line the lake. "There's a temporary closure structure at the mouth of these canals, so no longer will the lake's water be able to infiltrate into the heart of the city," he says. This is just one part of a massive $14 billion upgrade of the city's flood protection system. When it's complete next year, it will include new pump stations, floodgates on all major canals and waterways, safe houses for pump and floodgate operators and a massive surge barrier east of the city. Public trust in government, especially the agencies overseeing the city's flood protection system, took a hit because of Katrina. After the storm, the area's hodgepodge of levee control boards was reorganized into a single flood protection authority, run by engineers, geologists and others with technical backgrounds. We took lessons learned from Katrina. We're building a true system — and we're building it in a true form that provides perimeter protection. I think a true lesson learned is, don't allow flood surge to come into basically people's backyard. Doody says he believes the changes have helped rebuild the public's trust in government, and in the city's flood protection. "What I really am hopeful of is that once the system is complete, that anyone who is still feeling a little leery about living in the area, but wants to return home, can feel comfortable that they can, in fact, come home," he says. Just around the corner from where the new pumps and floodgates were installed is one of the areas where the floodwalls failed during Katrina. The new section is clearly visible -- it's a lighter shade of concrete. Jimmy Krummel bought and renovated a house just across the street. He says he's not worried about the possibility of more flooding. "Since they put new floodgates up, I have confidence in the wall," he says. "The wall that they repaired that broke, that would never -- if you seen them rebuild it, it would never break again. It might break on both sides. That would never break again." A recent poll by Louisiana State University shows more than 60 percent of residents share Krummel's confidence in the city's upgraded flood protection. There's no question that the amount of work done in the past few years has been impressive. Throughout the area, old floodwalls shaped like the letter "I" have been replaced by new, more stable floodwalls shaped like the upside-down letter "T." More than 350 miles of levees and flood walls ringing the area have been raised, strengthened and in some cases armored with concrete. Army Corps of Engineers Col. Greg Gunter, one of those in charge of the upgrades, says it's a whole new strategy of flood control. "You know, we took lessons learned from Katrina," he says. "We're building a true system -- and we're building it in a true form that provides perimeter protection. I think a true lesson learned is, don't allow flood surge to come into basically people's backyard. And that's what we're preventing with this perimeter system." Vic Zillmer knows what he's talking about. He's a retired colonel with the Army Corps of Engineers and worked on projects in the Balkans and Iraq. He's now helping oversee construction of a nearly 2-mile-long surge barrier in what, during Katrina, was the scene of a catastrophe. It's about 9 miles east of the Lower 9th Ward, where the old Mississippi River Gulf Outlet -- which is now shut down -- meets the Gulf Intracoastal Waterway, he says. Zillmer recalls the dire scenario that led to the flooding of St. Bernard Parish and much of New Orleans. "Katrina came in and the levee around St. Bernard Parish and the levee around New Orleans East acted like a funnel," he says. "And the water came up through -- took all of the water out of Lake Borgne and pitched into the city. It was about 18 feet high at this point with a 7-foot wave. It was about 25 feet where we're standing." Workers are busy on top of the surge barrier. It's 26 feet high and almost complete. They're using steel and concrete to build three barge gates. The gates will close before a storm hits, sealing the city's perimeter defenses. Once the surge barrier and the rest of the upgrades are complete next year, Corps officials say New Orleans will be protected against a 100-year storm event. Workers have nearly completed the 26-foot-high Lake Borgne Surge Barrier. They're using steel and concrete to build three barge gates, which will close before a storm hits, sealing the city's perimeter defenses. But what about larger storms? Zillmer acknowledges that Katrina -- if it had hit New Orleans directly -- would have overwhelmed even this new surge barrier. "But even something that large, it would hit this and would stop most of it," he says. "And you have a containment pool on the backside to hold the rest that comes over. And the idea being ... this thing was 'built for 100-year flood but is resilient to a 500-year flood.' Which means a 500-year storm would hit this thing and do very little damage to it. It's designed to be overtopped." A major hurricane -- with rain, high winds and a massive storm surge -- would still bring flooding to New Orleans. But Corps officials say the new upgrades should prevent the kind of catastrophe seen in Katrina. Robert Bea, an engineering professor at the University of California, Berkeley, is not quite as optimistic. He's spent some 14,000 hours studying New Orleans flood protection since Katrina. He believes that even with the new upgrades, the levees and floodwalls are more of a "patchwork quilt" than a true flood protection system. If and when the "big one" hits, Bea says there's still likely to be significant breaching of levees and floodwalls. "And the reason for that is not because of the strong links the Corps has built, but because of the weak links in the system that pre-existed Katrina," he says. Bea says a repeat of the Katrina destruction is unlikely. But, a major hurricane is likely to bring flooding and, possibly, loss of life. Bea believes that the 100-year flood protection planned for New Orleans is inadequate. Many others agree. John Barry is a board member of the area's flood protection authority and author of Rising Tide, about the 1927 Mississippi flood. He says the promise of protection against a 100-year storm can be misleading. Storms, he notes, don't pay attention to statistics. "And over a period of 100 years, roughly your lifetime and your kids' lifetime combined, there's a 63 percent chance you will see a storm greater than the protection system," he says. "So, when you understand that, then you begin to understand why it's not a very good level of protection." Even the Corps acknowledges that New Orleans needs more than 100-year protection. It's a hurricane-prone city where half the land is at or below sea level. But improving flood protection further is a question, not of engineering, but of policy and money. And that's a question not for the Corps, but for Congress.